Wearable tech isn't just a name, but rather, a clear statement of purpose. In order to be successful in the market, the device must be both wearable and technically savvy. That's a point Ringly tries to address with both high-end aesthetics and powerful technological functions. Ringly looks like an impressive—some might say “gaudy”—piece of jewelry, a ring with a rather large square-cut stone set atop it. It's crafted in 18-karat gold, a three micron plate, and the stone can come in a variety of options both precious and semi-precious to ensure that taste and budget are satisfied. It comes in just three sizes: six, seven and eight, and is expected to start shipping later this summer. But the looks aren't the only thing of note about Ringly. 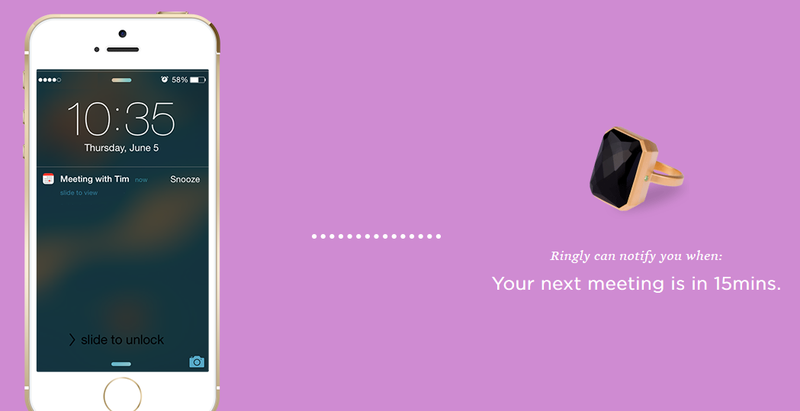 The Ringly device connects to a smartphone—either iOS or Android flavors—by way of an app. The Ringly device can then flash colors or vibrate in certain patterns according to what kind of content is coming into a device. It has four separate vibration patterns and five different colors available, so the device may vibrate a certain way when an email arrives, or may flash a certain color when a Twitter feed has updated. Meeting times, calendar functions, and a host of others can all be represented by the ring's various interactions, making it a great way to present a reminder when the phone it's connected or isn't immediately visible. While some may fault the Ringly for being too gaudy, or for not offering enough functionality, what really matters here is that the Ringly has expressed both sides of the wearable tech proposition. It is indeed wearable; there are some people who will really find such a ring a match for tastes, and are probably already wearing similar rings. But it's also a valuable technological addition; it offers a lot of notification options that will prove valuable, especially to those in the field. Granted, the Ringly is kind of a limited-scope item—those who don't wear a six, seven or eight ring are basically excluded—but for those who fit in this class and don't find the stone a little much, the end result is going to be an attractive-looking new ring that offers some useful technological components as well. Wearable tech has often suffered from a lack on one side of the aisle or another; either the technology is insufficiently useful or the design so unimpressive that users don't have an interest in wearing it. The Ringly, however, should go a long way toward keeping both sides happy. Those interested can pre-order one of several Ringly pieces now; most are $195, but the “Into the Woods” version in emerald runs $260. The pink sapphire “Wine Bar” edition, meanwhile, is at last report sold out. But regardless of which one's preferred, the Ringly should offer an attractively packaged way to unobtrusively receive notifications. That makes this a clear example of wearable tech that's attractive enough to wear, yet sufficiently technologically powerful to make it worth wearing.